Julian "Jules" Standen is a record producer and engineer that worked with the Smiths first hand in the studio. After a 25 year freelance career he now runs Gearslutz.com, one of the largest pro audio/recording forum online communities. He was kind enough to respond to an email I sent him, and was willing to answer a few questions about his experiences. Smiths On Guitar: Can you tell us about your background in recording and how you came to work with John Porter and The Smiths? Jules Standen: I was a Tape Op at Matrix Studios, London, UK. I started as a Tea Boy in Feb '82. An important part of the team was the engineer Bob Potter. I saw him as my mentor and I assisted him on a lot of sessions. Smiths On Guitar: How many Smiths sessions did you work on? JS: The first released singles and then the debut album. Smiths On Guitar: What was the usual order in which the tracks were constructed? Did the band play together live in the studio, or was everything built on a click track? JS: Live takes- but often just keeping the drums, then carefully overdubbing everything after that. I can't remember if they used a click or not..(I think perhaps yes). Smiths On Guitar: What do you remember about the guitars, amps or effects Johnny used in the studio? JS: John Porter rented in in 2 vintage, tweed covered Fender amps. The signal to them was split by a Boss stereo chorus pedal. 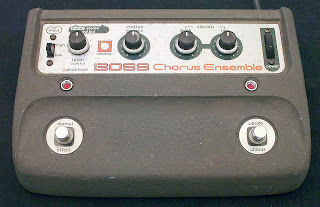 This was the stereo chorus effect from the Roland JC120 amp in pedal form. Guitars [that were] used included a vintage Gibson 335. I let Johnny borrow my own 1972 Les Paul Standard and my 1953 Gibson SJ acoustic. I think both may have been used a little, I am not 100% certain. Other vintage Gretsch guitars were brought to the studio, perhaps a Telecaster of the producer's also. Smiths On Guitar: What kinds of recording gear was John Porter using? JS: One Eurei 1176 would be used on vocals. On the bass and guitars 2 DBX 160 compressors were almost ALWAYS used on the console insert points - at a ratio of 3:1 pulling about 1 or 2 db of compression on the loudest passages. These were NOT stereo linked. The stereo (chorused) mic'ed, twin amp signal, was recorded on two tracks. The amps were placed far apart to pick up the maximum 'stereo' effect of the pedal. John Porter almost always insisted that everything done on guitar was double tracked. For bass there would have been a DI signal - through a basic DI box and a mic on the amp. New strings were important for bass recordings - perhaps a set per song. The 2" tape machine was a Telefunken. It had no remote control - so it was my job to sit next to it and load tape reels on and off it, press play, rewind & fast forward, arm tracks for record and press record. I would locate by looking at the number display and my notes for the song - the passages that the production team wanted to work on. I also helped set up mic's, amps etc. I was in the control room with the band and producers full time. The console was a custom one made for the studio by its chief tech and maintenance guy Tim. The studio acoustics were 1970's 'dead style' and no 'room sound' or 'ambience' was recorded or desired. The band did the first singles and album in this very small "studio 2" room. Smiths On Guitar: Did Andy, Mike or Morrissey stay in the studio when Johnny was overdubbing guitars? JS: They would be hanging around in the recreation area, perhaps playing pool, watching TV, reading NME, Melody Maker or out record shopping. Morressey was the least sociable - and only seemed to talk to the band members, John porter and Geoff Travis the record label boss. The control room was VERY small - so with John Porter, Engineer Bob Potter, Johnny Marr and myself. It would be pretty full already..
Smiths On Guitar: Did you have any personal interaction with Johnny or the rest of the band? JS: During breaks in recording Johnny and I would hang out together a bit. We both idolized Keith Richards but each for different eras of his career, I would show him him how to play strummed open tuning (E/G) versions of 70's Rolling Stones tunes that were one bared finger and 2 finger "suspended" notes (which he took only a mild (but tactfully polite) interest in) such as songs like "Happy" or "Soul Survivor" from the Exile on Main Street album and he would try to teach me earlier 1960's fingerpicking guitar parts such as "The Last Time" from the Through the Past Darkly album (as it was those more complicated finger pick riffs that really interested him) and usually I would find them all a bit too fiddly, complicated and hard to master! (but I can still play the intro motif for "The Last Time" thanks to his patient tuition). I was invited to stand and watch from the mixing desk area at the bands packed gig at the ICA art gallery - next to me was the UK Record co boss Geoff Travis and seeing them for the first time was also Seymour Stein of Sire Records (who later signed them to his label for the USA). Later on The Smiths and I happened to be in New York at the same time so I visited them backstage at their first ever concert in the USA at the NYC club Danceteria. It was New Years Eve, 1983. I arrived late missing the actual gig - (they were very unhappy about their performance) but it was fun catching up with them and surrounded by strangers they seemed very happy to see a familiar face. Great interview indeed. Thanks for sharing. Great blog, in general! I really enjoyed this interview. Good inside info from someone who was there! Love this kind of thing...it helps to complete the picture of a great moment in time that we can enjoy forever just by pushing play. Thanks for doing it. Thanks for this- great info and insight...and great blog all around. Thanks for your work.